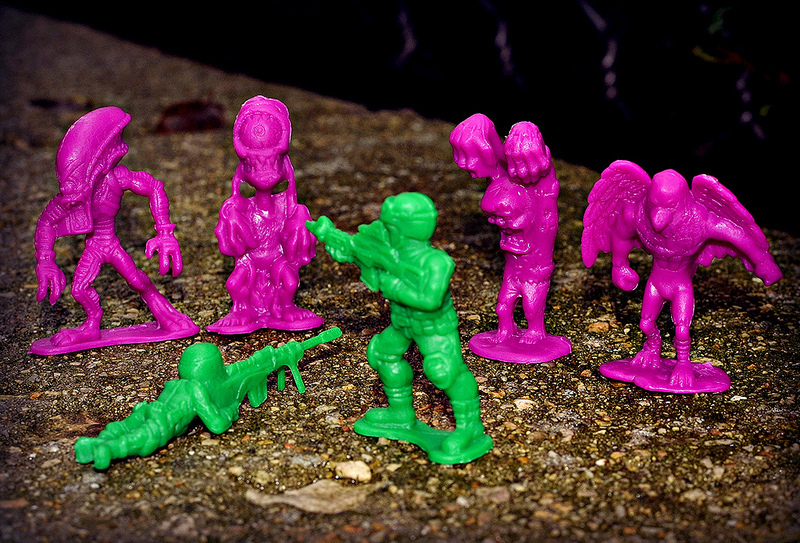 Has anyone else noticed that '80s-style bags/buckets of cheap plastic figures have made a little bit of a comeback? For years they seemed to be just a memory of junk stores and drug stores of the past, and then all of a sudden there's the True Legends buckets sold at Toys R Us, Imperial zombies vs. zombie hunters, Tim-Mee Toys reissues, Space War and others. I'm not sure what's going with that, but I'm not complaining. I say bring on these chintzy little weirdos by the bucket-loads. On my latest trip to Target, yet another new release of this kind caught my eye. I noticed them along the back wall of the toy section hanging out with the other small, misfit toys. 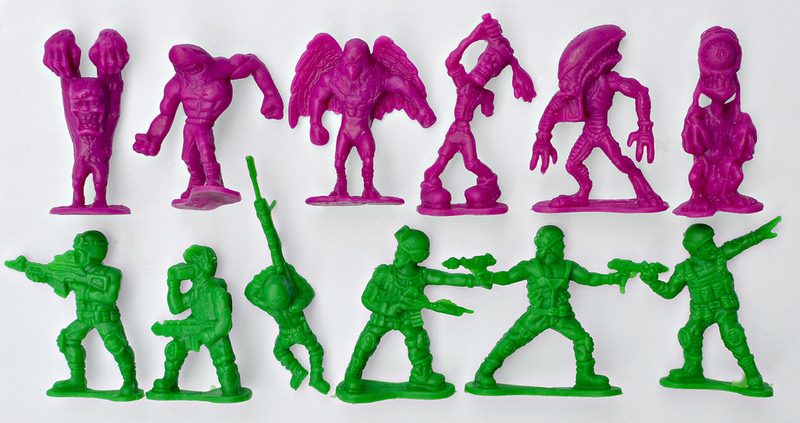 I saw they were called "Battle Warriors" and came in clear tube containers with twist-off caps, and that there were two assortments: Monsters vs. Military and Robots vs. Ninjas. I of course quickly grabbed the monster bucket to get a closer look, and made the decision to purchase it in about four seconds after seeing that the monster sculpts looked pretty damn cool and came in a great neon purple color (think the neon purple from Monster in My Pocket). Plus, it was only five bucks. As you can see, we've only got one zombie here. The other weirdos include a crazy Frankenstein's monster dude with huge arms, a shark-man, a bird-man, a Xenomorph-style alien, and a sludgy cyclops thing which kind of looks like one of the Oh No! Aliens. I really like how they're all very different, and the sculpts are nicely done for this type of cheap toy set. The figures are around 1.5 inches tall and are made of a light, hard plastic, but the material also has some give to it so you can bend parts without having to worry about them cracking easily. The only thing I wish is that the monsters came in more than one color--that way it would be much more worthwhile getting a bunch of the same sculpts in each tube. But for five dollars, this set is well worth picking up for any lover of little weirdos. In fact, I'm pretty tempted to get the Robots vs. Ninjas set now. What do you think of these guys? Have any of you seen them in the store or picked up a set yet? Heading to Target today to see if I can find one of these! Fun stuff! I too am glad this kind of thing is making a comeback. Hopefully we'll continue to see more and more of them! I found the monsters vs military, im having trouble finding the robots vs ninjas. Cool. Yeah, these were in short supply at the Target where I got mine. They only had a few total. I got the last two tubes of the monsters at Target, and the last tube of robots/ninjas. The robots and ninjas are molded in both red and blue, unlike the monsters, which are only purple and the soldiers which are only green. I was so stoked to find them. I just got them too, I think there awesome.. My favorite one is the dual wielding sword robot. 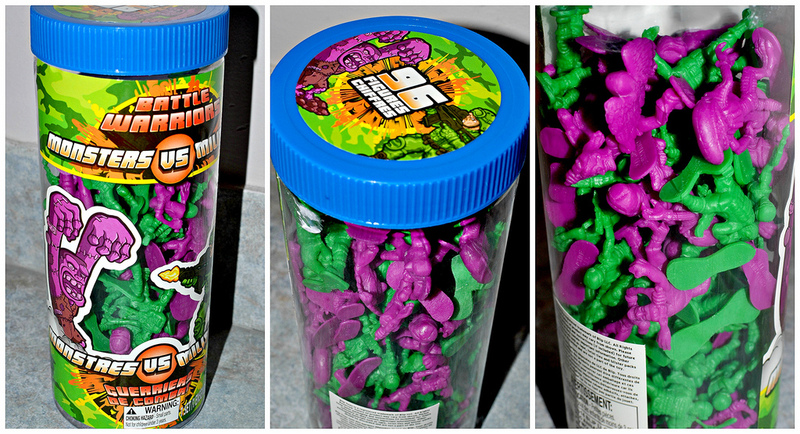 I think it was nice of them to mix the colors, hopefully we get more different kinds and they continue to do that, also when I got mine it was the last 2 tubes and they were really easy to miss, also noticed when I was counting the monsters vs military I got like 8 of each different mold, but with the ninja's vs robots I seperated them and there was 4 of 2 different kinds, then 6 of a few kinds then 7 of a few, it seemed very mixed in the molds, I had a few that were melded together and had to rip them apart, 96 is alot of figures and for the 5$ price is crazy good, I'm going to buy a few more tubes just because. Finally relented ad bought them on ebay. Still a good deal! Cool. Seems like different chains get different kinds of these. I've only seen the Monsters/Military ones at Target.